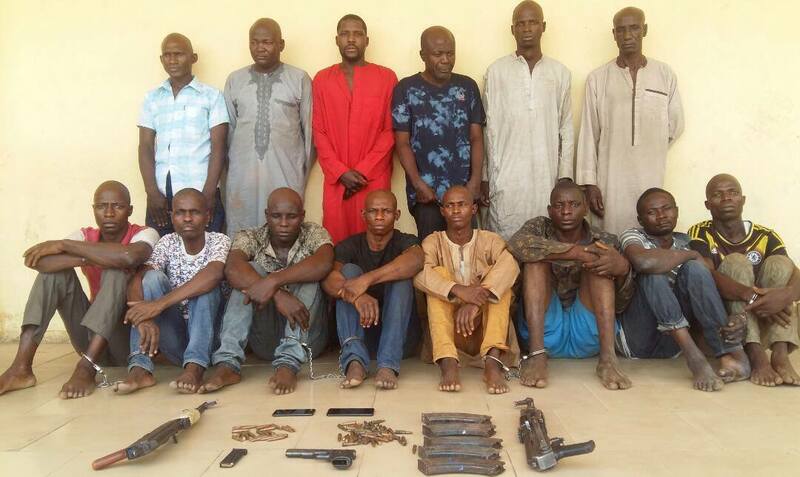 Detectives attached to the Inspector General of Police (IGP) Intelligence Response Team (IRT) have arrested 14 suspected kidnappers along the Kaduna-Kano expressway. The raid also led to the recovery of three automatic rifles and various exotic cars which the police said were snatched from victims on the highway from 2017 to date. Their arrest was sequel to the murder of Dr. Ibrahim Mailafia, a senior lecturer with Nasarawa State University. The police said the deceased professor was suspected to have been killed on November 3, 2017 by the gang along Kaduna-Kano expressway. It also said that the deceased was killed while on his way to Kano to visit his family after obtaining a Doctorate Degree on Artificial intelligence from United Kingdom. Police spokesman, ACP Moshood Jimoh, who confirmed the arrest, said the exercise was in continuation of the mandate given to operatives of Absolute Sanity and IRT led by Abba Kyari. He listed the suspects as: Sunday Jatau, 35; Solomon Jatau, 40; Ayuba Jatau, 32; Ishaku Luka aka Dogo, 42; Bature Adamu; Bello Abdullahi, 32; Mamuda Mohammed, 27; Ibrahim Daniel, 27; and Emmanuel Garba, 27. Others are: Usman Mohammed, 35; Ibrahim Baba, 49; Bello Aliyu, 36; Surajo Mohammed, 35 and Hassan Ibrahim, 55. He said that Sunday Jatau who hails from Kaduna State is the leader of the gang and that he confessed to have personally shot and killed Dr Mailafia, while Solomon and Ayuba Jatau are brothers to the gang leader, Dogo, who allegedly sells arms and ammunitions to the gang. He said that Ibrahim Daniel hails from Chad Republic and was arrested while in possession of late Dr Mailafia’s phones. Jimoh said the suspects have all confessed to several armed robbery, kidnapping and killing on the highways of Kaduna, Kano and Niger states.